Fantastic performance by Mr Sheeran. Tickets came from Gigantic with plenty of time. Superb service will definitely use again. What a night! How one man and his guitar could pull that off I don't know. All four of us enjoyed the evening immensely. The stage setup was just amazing, really effective for those of us seated further away, video graphics superb. Really impressed with the sound in the arena too. Top marks all round to the technical teams. And seeing Anne-Marie again was a real bonus (I've seen her previously). Venue was no hassle at all, very efficient entrance and exit, nearby parking easy. Our whole family really enjoyed Ed's performance. He's such a talented writer and singer. The whole crowd joined in so there was a great atmosphere at the Principality Stadium in Cardiff. "One man and his guitar"
Ed Sheeran was absolutely awesome. Such a down to earth artist we can all relate too. Great staging, incredible sound and an amazing night. Go Ed!!!! Just don't understand the way over priced drinks and snacks at the stadium. I t really is a massive rip off. Thats the only thing I had to moan about. Suffolk’s finest singer and song writer Ed Sheeran is back on the block. This year, he plays some of the very biggest shows of 2019 and you can see him play at Roundhay Park in Leeds and Chantry Park at Ipswich during August. There are few artists who manage to combine musical authenticity and mass appeal so successfully, but Ed Sheeran is surely one of them. Mixing hip hop, funk, rock, pop and folk, this singer-songwriter isn’t afraid to experiment, and his creativity has not gone unrecognised. Sheeran’s EP ‘No. 5 Collaborations Project’, which he released independently in 2011, caught the attention of American actor and musician Jamie Foxx and musical dignitary Elton John. Later that same year, he signed an international record contract with Asylum records and released his chart-topping album ‘+’. The record, which was written at the tender age of 17, went multi-platinum in the UK, Ireland and Australia, and helped him to earn BRIT Awards for British Breakthrough Act and British Male Solo Artist in 2012. The gifted singer has since gone on to receive a number of other prestigious accolades, including MTV Video Music Award for Best Male Video, a Young Hollywood Award for Artist of the Year and an Ivor Novello Award for Best Song Musically and Lyrically for his hit single ‘The A Team’. And it’s not just the UK that’s gone head-over-heels for this genre-crossing boy wonder. Following his guest appearance on Taylor Swift’s 2012 album ‘Red’ and his subsequent support slot on her North American tour, the Suffolk-born star has made a name for himself in the United States too. He has also supported Snow Patrol on select dates of the North American leg of their ‘Fallen Empires’ tour. Sheeran’s much-anticipated second studio album ‘x’, which was released in June 2014, has been positively received by fans and critics alike and an international Ed Sheeran tour has been scheduled to support its release. The song ‘All of the Stars’, which is a bonus track on the deluxe edition of the record, features in the smash-hit film ‘The Fault in Our Stars’. Continuing the theme, Sheeran’s latest album is titled ‘÷’ which was released during March of 2017 to huge fanfare. The excitement was justified as it brought with it the singles ‘Castle On The Hill’, ‘Shape Of You’, ‘Galway Girl’, ‘Perfect’ and ‘Happier’ which helped the LP break the Top 5 and achieve Platinum sales status. ‘÷’ won a Grammy Award for Best Pop Vocal Album. 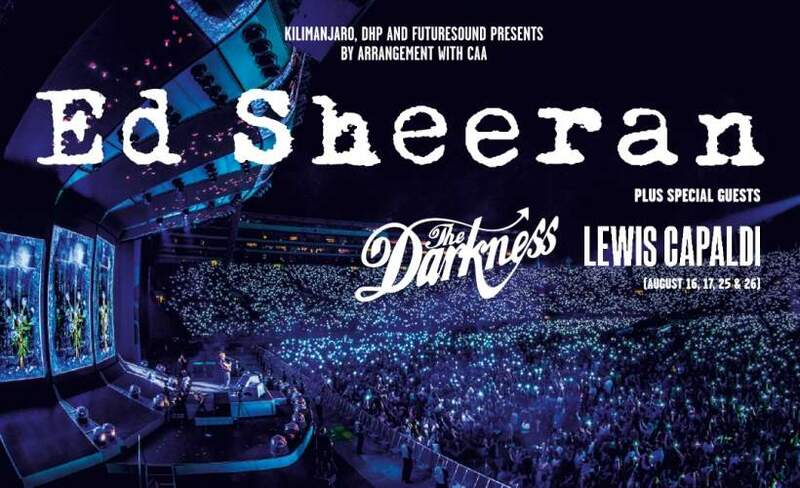 Ed Sheeran tickets have been known to sell out quickly so if you want to catch this stellar artist in concert, you will need to act fast. To be lucky enough to catch Ed Sheeran live, keep a close eye on Gigantic.